Forage fish are at the heart of many marine food webs. Eaten by many species, including people, they are economically, ecologically, and often culturally important. Their numbers are also notoriously variable. So how do you maintain resilient social-ecological systems that are dependent upon forage fish? This was the central question of our in-depth case study of Pacific Herring and the food web and human communities they support in Haida Gwaii, British Columbia. In the NE Pacific, Pacific Herring have crossed a tipping point, resulting in fisheries closures and potential consequences for seabirds and marine mammals, and tensions around herring management. Climate and overfishing led to declines in herring, and recovery of predators may be slowing recovery. Social science researcg can help identify social-ecological thresholds of sustainability for marine management and set appropriate social-ecological targets for herring recovery. Using a tipping points lens to evaluate tradeoffs helps managers identify the safe operating space for decisions based on interacting ecological, social and economic risks. Indicators that provide early warning of change can help managers avoid crossing tipping points or monitor progress of restoration efforts in systems that have already crossed tipping points. Scenario analysis helps identify the ecological, sociocultural, and economic outcomes of different fisheries management actions and access people's preferences. Globally, many fisheries have crossed critical thresholds (i.e., tipping points) with serious ecological, economic, and cultural consequences1,2. Marine forage fish species, such as herring, sand lance, sardines, anchovies, and squid, are particularly important species both ecologically and socially, as they serve as the chief link between their prey (zooplankton and phytoplankton) and the predators that rely on them as a food source (e.g., mammals, birds, larger fishes). They are also characterized by dramatically fluctuating populations and are vulnerable to overfishing and other pressures, such as climate change and disease3. Many of these species have crossed tipping points and their declines have created major shifts in the social-ecological system in which they are embedded. For example, in the 1940-50s, in response to changes in ocean climate and overfishing, sardine populations on the west coast of North America experienced a collapse, displacing a whole industry and affecting people’s livelihoods4,5. Across the northwest coast of North America, Pacific herring and its eggs or roe are critical prey for a host of fish (e.g., hake, Pacific cod, dogfish, salmon, rockfish), birds (e.g., puffins, gulls), and marine mammal predators (e.g., humpback whales, stellar sea lions, seals), as well as some terrestrial predators (e.g., black bears). Declines in herring, like other forage fish, are thought to affect the recovery of these predators, some of which are threatened or endangered species. Recent work, for example, has quantified the link between the biomass of forage fish in the ecosystem and seabird breeding success. Tipping points science identifies an ecosystem threshold of 1/3 for the birds, suggesting that forage fish biomass should be maintained at levels higher than typical fisheries harvest guidelines allow6. Herring has also been central to the social, cultural, and economic relations of coastal indigenous communities for many thousands of years (Mackechnie et al 2014), and many communities seek to continue their traditional fisheries for herring and herring roe on kelp. Industrial seine and gillnet fishing of adult fish for their roe has also contributed to the economy and livelihoods of many communities across the Northwest Coast. In Haida Gwaii, a remote island archipelago located 100 kilometers off the northwest coast of British Columbia, Canada, Pacific herring are a key forage fish species in the coastal food web and are central to the marine economy and Haida culture. Although nearly 5,000 square kilometers of the land and sea of Haida Gwaii are afforded some protections through the Gwaii Haanas National Park, Gwaii Haanas National Marine Conservation Area Reserve and Haida Heritage Site, and much effort has been dedicated to the preservation of Haida Gwaii’s local cultural and natural features, abrupt shifts in the state of the ecosystem have occurred historically in the region. A sharp population decline in herring stocks occurred in the 1960s and, following a recovery, again in the 1990s. This resulted in fisheries closures, and this once-abundant forage fish has been slow to recover from the most recent decline, despite management efforts. This has had significant consequences for ecological and human communities, and has led to tensions surrounding herring fishing among First Nations, the Canadian government, conservation groups, and commercial fishery interests. While understanding thresholds and their drivers is important for managing natural resources, understanding alone is not sufficient and must be accompanied by good governance (Battista et al 2016; Kelly et al 2015). Gwaii Haanas’ cooperative Archipelago Management Board (AMB), comprised of representatives from the Council of the Haida Nation, Parks Canada, and Fisheries and Oceans, Canada, has implemented an interim management plan for restoration and protection of the valuable ecosystems of Haida Gwaii. The Ocean Tipping Points team is working with the AMB and other managers, scientists, and community members to develop a better understanding of the drivers, dynamics and trade-offs associated with past and potential ecosystem shifts in Gwaii Haanas and the tools necessary to apply an ecosystem approach to management. Below we describe how ocean tipping points science can help anticipate and prevent ecosystem shifts in fisheries or restore fisheries systems if they’ve already crossed tipping points, drawing on some of the key approaches we applied in and lessons learned from our case study focused on Pacific herring in Haida Gwaii, BC. Learn more about our research! Complex sets of human and natural pressures combine to affect ecosystems and the fisheries’ they support, making it challenging to identify key drivers and management levers. Furthermore, once tipped, ecosystems can experience feedbacks that make it challenging to restore systems to previous (or preferred) states. Understanding tipping points and identifying key drivers and feedbacks can help prioritize effective management actions and help inform appropriate conservation and restoration targets. Several potential drivers of herring declines and slow recovery have been suggested, including overfishing, disease, increases in predator populations, and climate change, but the true causes have remained difficult to pinpoint3. Disentangling and understanding the contribution and consequences of these drivers is important for determining management actions for recovery of herring stocks. In Haida Gwaii, we analyzed time series of herring spawn and herring catch data at both regional and local scales and examined two potential drivers of change: commercial fishing, and ocean climate (Stier et al in prep). Our results indicate that recent slow recovery of the overall Haida Gwaii herring population is due to depressed population growth rates in 90% of stocklets. We also found that fishing and ocean conditions were key regional environmental drivers impacting herring dynamics. Regional ocean temperature affected herring population growth, with herring population growth rates increasing in cold years and decreasing in warm years, particularly for stocklets with low intrinsic growth rates. Strong differences in the timing and location of fishing further contributed to declines in overall herring populations across the archipelago. However, our model indicates that there are other drivers of this ecosystem shift for which we haven’t accounted. One driver in particular that we didn’t examine was the recovery of marine mammals that prey on herring. Increases in humpback whales and sea lions may underlie declines in herring population growth. In addition to the contribution of different drivers to herring population dynamics, we found that fluctuations in local populations were historically more asynchronous than they are today. In other words, if one stocklet was experiencing a decline, others may have been unaffected or experiencing high abundances. This spatial asynchrony can provide a “portfolio effect”, similar to portfolios in the financial sector, where extinction risk is mitigated by enhanced regional population stability. More recently, local herring populations have been experiencing greater synchrony in their spawning. Thus, historically, herring populations would have provided more reliability at the regional scale for mobile predators, commercial fishermen, and subsistence harvesters. It appears this resilience has been eroded in today’s herring population. Although we didn’t examine the recovery of predator populations as a driver in our spatial model, understanding these species interactions is a key element for understanding drivers of change and ecosystem shifts. This is because species can be influenced by changes to their predators, prey, or competitors, and are embedded in complex food webs with many interactions. Herring and other forage fish are key species in nearshore pelagic food webs, whose abundance can be influenced by their predators, such as humpback whales, and their food sources, primarily zooplankton. Changes in herring can also influence other species in the food web, leading to overall ecosystem shifts. Ecosystem history, including environmental conditions and different initial species abundances, will influence the effectiveness of different recovery strategies in systems that have crossed critical thresholds. For example, the trajectory of a prey population, such as herring, may depend on the environmental conditions and available resources, the density of competitors, and the density of predators in the system when a decision is implemented (Stier et al. 2016a). General lessons from theoretical and empirical studies suggest that the exploitation history of a system connected through trophic links can affect recovery (Stier et al. 2016a). Using a theoretical model of predator prey interactions we examined how the recovery timing of predators (e.g., humpback whales) can influence the recovery of their prey (e.g., herring) (Samhouri et al., submitted). Our theoretical work suggests that the recovery of herring stocks may be slow because the recovery of herring predators occurred before fishing pressure was reduced on herring. Thus, recovery may require fishing levels to be reduced below the levels that originally caused a population to collapse (e.g., Collie et al 2013). To find out more, see our research paper. Examining data of predator-prey relationships and other species interactions can help disentangle these complex dynamics, uncover potential ecosystem effects, and identify potential feedbacks that slow recovery. However, in many systems data on the linkages among species within the complex food webs are limited. In these cases, resource managers often turn to experts to help develop qualitative and quantitative models of the food web (e.g., Ecopath, Network Analysis, Bayesian Belief Networks). These modeling approaches can be useful for understanding ecosystem linkages, potential drivers of change, and potential outcomes from different management decisions. In Haida Gwaii, Pacific herring are thought to be key species in the foodweb, providing an important subsidy throughout their lifecycle (i.e., as adults and through their roe (eggs) and milt (sperm)). In addition, several factors may influence herring population dynamics, including climate, fishing, and predation by marine mammals, fish, and seabirds. Food web models are a useful tool to examine the extent to which herring may influence the abundance of their predators and the potential outcomes of different management decisions and/or environmental changes on the food web (e.g., increases in zooplankton, changes in predator abundance). To develop food web models, managers often turn to experts. However, different experts may perceive the structure and interactions in a food web differently, which may lead to differences in perceived outcomes from different management decisions and potential for conflict among different resource users. To understand if and how different people perceive the herring-centric food web, we developed qualitative food web models of the Haida Gwaii ecosystem (Stier et al., 2016b). We surveyed a number of experts from academia, Canadian government agencies, First Nations, and other traditional and local knowledge holders to document varying expert perceptions of ecosystem interactions and explored their implications for conservation and management. For each expert, we constructed their mental map of the food web interactions among species and simulated responses of these networks to hypothetical scenarios, including an increase in herring, the continued recovery of herring predators, and changes in ocean productivity. Our analysis showed that, across all experts’ mental models, increases in herring predators, such as whales, led to a predicted decrease in herring and other forage fishes, whereas simulated increases in productivity predicted increases in relative abundance of all species. However, predictions about changes in the food web driven by changes in herring varied among experts. Lesson learned: Experts vary in their perceptions of food webs centered on Pacific Herring. Simulating herring recovery with each unique mental model demonstrated wide variability in the perceived importance of herring to the surrounding food web and consequences of potential future management actions. These differences were not predicted by demographics of the experts. We show that among-expert differences in perceptions of ecosystem structure are logically tied to the consequences for how an individual might view the outcomes of predicted future change. Thus, for managers considering the development of models based on expert opinion, it is important to include multiple perspectives and “different ways of knowing”. This will allow a greater total space of available knowledge to be captured. Furthermore, while variable expert perceptions can lead to conflicts among stakeholders, explicitly capturing and acknowledging variation in expert perception may help reduce conflict. Coupled social-ecological systems are made up of many stakeholder groups often with competing needs for, relations to, and values of the environment and natural resources. In many cases, despite these differing needs and values, people’s well-being is coupled in one or more ways to the health of ecosystems. Thus, managing natural resources requires consideration of multiple stakeholders’ values and preferences. Understanding social-ecological linkages, detecting sociocultural thresholds and eliciting people’s preferences for particular ecosystem states can help managers define management targets for recovery and understand potential trade-offs that might arise with different decisions. Pacific herring are key species that contribute to cultural, social and economic well-being in Haida Gwaii. Herring have been central to Haida lives, livelihoods and culture for thousands of years (Jones 2000, Jones 2005, MacKechnie et al. 2013; Haida Marine Traditional Knowledge Study 2011). To understand the diverse socio-cultural values and practices regarding herring, we worked with the Haida Nation to implement semi-structured interviews with Haida community members. This helped us characterize the social impacts of ecological and management changes, both past and future, and is helping guide goal-setting for fisheries and ecosystem managers in Haida Gwaii. Linking Haida values for and relationships with herring with the spatio-temporal changes in herring populations, we identified potential social-ecological tipping points in the system. Specifically, we identified thresholds of herring abundance and distribution that exist for meeting cultural objectives. Such cultural objectives include, for example, resource access, knowledge sharing, identity, and cultural continuity. When there is enough herring and roe on kelp to harvest in the right places at the right time, community members can take part in harvesting and share knowledge across generations about where and how to harvest, and maintain these cultural values. Herring roe on kelp is an important food in the seasonal round and contributes to community well-being, health and food sharing. In addition to these harvest values, herring are important to Haida as a way to connect with the ocean and other animals linked to herring. A guiding principle of the Gwaii Haanas Interim Management Plan (GHIMP 2010) is to “balance protection and ecologically sustainable use,” a goal that extends to all of the land a seascapes of the Haida Gwaii archipelago. Furthermore, the GHIMP stipulates that management actions in Haida Gwaii must respect a range of environmental, social, economic and cultural values. However, there remains some ambiguity with respect to how ecological goals for sustainability intersect with social, cultural, and economic goals. To resolve this, we are helping to build a definition of sustainability for herring fisheries that embeds the socio-cultural values regarding herring on Haida Gwaii. To do this, we used mixed community-based social science research methods. Starting with categories of sustainability and the herring fishery that we are generating from existing documents, we implemented semi-structured interviews with local people to identify how they further define sustainability with respect to their relationships with herring and the marine environment. We then held a set of workshops that implement “Q-methodology”, where residents of Haida Gwaii are asked to sort a series of statements about sustainability and the marine environment developed from our interviews. This provided an understanding of the factors that influence perceptions of sustainability in the herring fishery and ecosystem management. These statements will be further integrated into scenario analyses that will allow us to identify anticipated effects of ecological changes on socio-cultural values to aid ecosystem-based decision making for Gwaii Haanas. Residents of Haida Gwaii, both Haida and non-Indigenous, offered to us several ways that the sustainability of their households and communities is linked to the status of the marine environment. Fisheries, such as salmon and herring, are among the most commonly identified ways that local people depend on marine ecosystems, but people also noted numerous additional amenities that relate more broadly to their quality of life. That is, the natural spaces of the Haida Gwaii archipelago do more than simply provide food for local residents. Local people shared with us a deep psychological connection to the place; parents describe the benefits of bringing up their children there, and islands’ youth talk about the archipelago as a place of possibility. Many non-Indigenous families, for example, talk about how both the abundant natural resources, marine as well as terrestrial, and also the overall quality of life provided by the rich local environment, offsets for them the challenges of remoteness posed by living on the Archipelago. Local control, by which people mean that local communities are best able to achieve the sustainable management of local resources. As such, locals believe that long-term sustainability of Haida Gwaii communities depends on whether decisions about environmental resources can be made locally. Livelihood security, with a focus on how local people can pursue meaningful and fulfilling life pursuits, and whether Islands youth see a future for them on the Archipelago. With respect to environmental issues, this relates to continued opportunities for locals to pursue environment-related careers. Community security, focusing not just on community-level food security but also whether the environment can be a context to bring together the diverse populace of the Archipelago, and develop a shared sense of community. The widespread community opposition to the development of the Enbridge pipeline is an example of an environmental issue that has brought Haida and non-Indigenous people together. When people show respect to local ecosystems, through traditional rituals as well as new, scientific rituals such as monitoring. Finally, Haida participants in the youth workshops also identified a personal tipping point regarding their feelings about living in Haida Gwaii. Several discussed how when they were younger, they felt unsafe, or embarrassed to be Haida. They wanted to leave, perhaps adopted by a non-Indigenous family. However, with the resurgence of Haida identity and power, embodied for example in the creation of Gwaii Haanas and also the Haida’s assertion of sovereignty over local timber operations, these same local youth now feel empowered, and proud, to be Haida. Some participants in the workshop talked about this personal tipping point as a matter of healing, saying that going into Gwaii Haanas is a healing act, both personally and culturally. Balancing ecosystem constraints and user needs and values necessarily requires managers of coupled social-ecological systems to evaluate trade-offs among stakeholders. In fisheries, operationalizing ecosystem-based management requires that we confront allocation issues not only among fisheries sectors, but also to the ecosystem. Using a tipping points lens helps managers identify the safe operating space for decisions based on ecosystem targets and people’s preferences and risk tolerances. Pacific herring are emblematic of the need to evaluate trade-offs among alternative forms of exploitation and conservation goals. In Haida Gwaii, Pacific herring are subject to at least two distinct fisheries: one that catches mature spawning adults for their eggs and another that harvests the eggs on kelp substrate after spawning occurs. In addition, natural environmental variation influences herring recruitment. Thus, assessing trade-offs should include evaluation of how this recruitment uncertainty can influence risk of fishery closures. Finally, managers of forage fish fisheries also are faced with accounting for ecosystem needs when determining appropriate harvest rates. To address these trade-offs, our team developed a stochastic, age-structured model to investigate the consequences of egg- and adult-harvest on herring populations, fisheries, and conservation of herring predators (e.g., seabirds) (Shelton et al., 2014). We examine how different combinations of harvest intensity affect herring biomass in relation to species-specific biomass thresholds and ecosystem thresholds in the form of herring biomass needed to support predators. Our approach provides a template to evaluate trade-offs between the two fisheries in terms of catch of adults and eggs, and includes risk to fisheries in terms of probability of fishery closures and the risk to ecosystems based on the dietary needs of predators that rely on herring stocks. We use the 1/3 for the birds rule of thumb to set a minimum threshold biomass to be left in the ecosystem for predators. The model also incorporates environmental variation in climate drivers and variable population dynamics to understand a range of potential changes to herring populations that could occur with different harvest strategies. We find that (a) there is a strong and asymmetric trade-off between the catch of adults and catch of eggs, where small changes in adult harvest can lead to large declines in mean egg catch but the effect of egg harvest on adult catch is relatively minor; (b) risk of fishery closure can change substantially under different recruitment scenarios where populations with high recruitment variability will decline below species-level biomass thresholds more frequently than populations with small recruitment variability; (c) many combinations of egg and adult-harvest rates can allow the herring fishery to remain open while at the same time maintaining average herring biomass above the ecosystem threshold intended to satisfy the needs of herring predators (Figure 6, Shelton et al. 2014). One of the most striking aspects of our model predictions is that ecosystem thresholds proposed to ensure the persistence of herring predators do not necessarily pose more stringent constraints on fisheries than these fisheries pose on themselves via hypothetical, but realistic, management targets. Interestingly, a hypothetical management target that avoids fishery closures more than 10% of the time placed a stronger constraint on both adult and egg harvest rates than the ecosystem threshold. Thus, an important lesson from these analyses is that the safe operating space for fishermen and conservationists can be similar and can aid in facilitating management actions to ensure fisheries and ecosystem needs are met in the long-term. Our work highlights that safe operating spaces exist that will allow the maintenance of stock biomass at levels that facilitate the persistence of forage fish predators and forage fish fisheries. Another novel aspect of this study is that we demonstrate a framework for integrating metrics that are socio-culturally relevant with ecological and economic metrics. By focusing on fisheries closures, we evaluate potential management actions based on something that really matters to people and for which different groups (e.g., subsistence users vs. commercial fishermen) may have different thresholds and risk tolerance. Many decision contexts contend with trade-offs that are non-linear, and these types of analyses can provide a transparent and straightforward decision support tool to address such non-linearities. This model and its scenarios can highlight opportunities for collaboration and cooperation among different stakeholders and offers the chance to avoid unintended consequences on unfished life stages and species. To facilitate this collaboration, we have developed an interface based on the model that can be used in a participatory process with stakeholders to help identify stakeholders’ risk tolerances and preferences for different fisheries management decisions. This decision tool allows stakeholders to explore the models we developed and change environmental parameters, biomass thresholds, and harvest rates to evaluate risk of fisheries closures and catch rates for herring adults and eggs. This will allow for information exchange and help decision makers and stakeholders work together to strike a balance between the competing needs of multiple stakeholders and species in the face of tipping points. To find out more, see our research paper, and check out our Decision Tool. Indicators are measurements of the biological, chemical, or physical states of an ecosystem that reveal its structure, composition, or function. Managers use suites of indicators to detect changes in ecosystem status and trends, to evaluate current and past policy decisions, and to help plan for the future. For ecosystems that exhibit threshold dynamics, indicators that provide early warning of change (i.e., early warning or leading indicators) can help managers avoid crossing tipping points or monitor progress of restoration efforts in systems that have already crossed tipping points. For example, measures of variance in components in ecosystem that respond more rapidly to change may provide earlier warning of impending transitions. One example from Pacific ecosystems is the rise in spatial variance in crustacean fisheries catches in Alaska prior to fisheries collapses (Litzow et al., 2013). Social drivers often precede ecological drivers by years or decades and may also serve as early warning of ecosystem shifts (Hicks et al. 2016). Given limited resources, the goal is to identify a set of indicators that can provide adequate information on status and trends and determine whether reference points or targets have been met and management goals achieved. In the face of tipping points, managers may want to include a number of early warning indicators in their portfolio. In Haida Gwaii, Pacific herring are key components in a broader ecosystem. 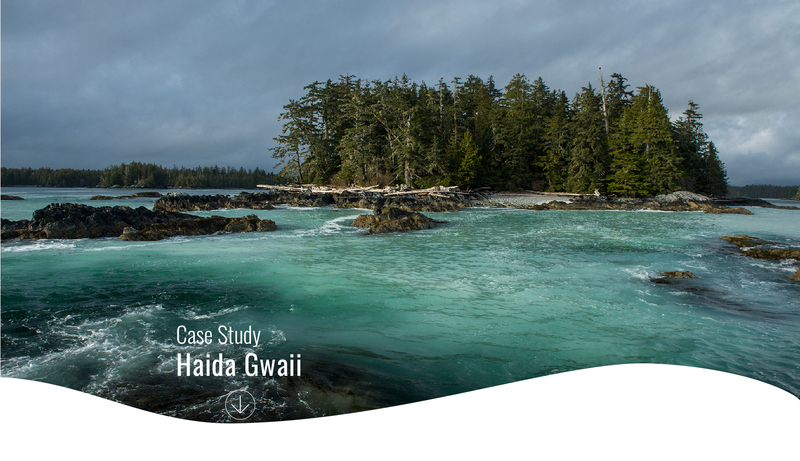 To manage ecosystems in Gwaii Haanas National Marine Conservation Area and Haida Heritage Site, managers needed to identify key components and determine indicators to include in their management and monitoring plans. To help inform their selection of a portfolio of indicators, the Ocean Tipping Points team identified a suite of potential indicators using a framework from NOAAs Integrated Ecosystem Assessment developed for the California Large Marine Ecosystem. Applying this hierarchical framework we developed conceptual models of linked ecosystem components and drivers of change for a range of ecosystems and then used a semi-quantitative, expert elicitation approach to compare sets of potential indicators for each ecosystem type across a range of sensitivity and specificity axes, with an emphasis on identifying leading indicators (Martone et al., 2015 REPORT (and if possible 2017 paper)). Conceptual models provided managers an opportunity to identify linkages and key gaps in indicator portfolios for a range of ecosystems, including herring-centric pelagic ecosystems. Furthermore, for Gwaii Haanas and other managed areas, management constraints influence how indicators are chosen. For example, many systems already have ongoing monitoring in place, affecting the bottom line of what can be added. We compared indicator portfolios from the hierarchical framework to those identified from ongoing monitoring programs with cost constraints. This helped managers to emphasize those indicators they should maintain and identified potential indicators that would help fill gaps in their monitoring plan. For systems that experience tipping points, applying portfolio assessments can help managers assess the value of added information and help fill gaps in monitoring plans with indicators that can help identify impending shifts. To find out more, see our report here and research paper(s). Scenario analysis can help identify the costs and benefits of different alternative management actions. In systems that are prone to tipping points, scenario analysis can be particularly useful because it generates multiple alternative descriptions of potential outcomes that include attributes such as processes of change, thresholds and uncertainties. Managers can explore alternative perspectives about thresholds, feedbacks, and system resilience, and gain insight into the potential consequences that may occur with abrupt or non-linear changes. Furthermore, where environmental thresholds exist, there may also be social-thresholds that inform target setting. For example, if an ecological threshold is tied to the economic value of an ecosystem, the costs and benefits of management actions will similarly follow a threshold curve. Scenario analyses can help uncover these social-ecological thresholds that managers can use to inform target setting. In Haida Gwaii, we will combine the findings from the interviews on socio-cultural importance of herring with results from ecological models of the herring ecosystem to evaluate how different ecological scenarios would affect a suite of socio-cultural indicators. We will hold a series of workshops with key local participants and identify social-ecological reference points. Future ecological conditions will be modeled based on possible management decisions and potential changes in the marine environment. In these collaborative workshops we will identify potential impacts of these different scenarios on people in Haida Gwaii. Outcomes from these workshops will help to build an understanding of how various marine changes result in specific social-ecological consequences identified by local people as important. These scenarios can help managers identify reference points for social-ecological dimensions of sustainability for marine management and set appropriate social-ecological targets for herring recovery. To find out more about our research, visit our website at www.oceantippingpoints.org and check out our scientific products. If you have additional questions, please contact one of our researchers. Pikitch, E., Boersma, P.D., Boyd, I.L., Conover, D.O., Cury, P., Essington, T., Heppell, S.S., Houde, E.D., Mangel, M., Pauly, D., Plagányi, É., Sainsbury, K., and Steneck, R.S. 2012. Little Fish, Big Impact: Managing a Crucial Link in Ocean Food Webs. Lenfest Ocean Program. Washington, DC. 108 pp. Lindegren, M, DM Checkley Jr., T Rouyer, AD MacCall, and NC Stenseth. 2013. Climate, fishing, and fluctuations of sardine and anchovy in the California Current. PNAS 110(33):13672-13678. Zwolinkski JP, DA Demer. 2012. A cold oceanographic regime with high exploitation rates in the Northeast Pacific forecasts a collapse of the sardine stock. PNAS 109(11): 4175-4180.